I love Valentines Day... in a way. I have not been dating anyone on a Valentines Day since I was in high school. So it is not about roses and gifts that I receive, but instead the ones I spoil my sister with. Here are a few gift ideas that I have done in the past that were easy to complete. In the picture above are two different gift ideas and a third hidden idea. Hello Mod Podge. This was a simple paper mache box from the craft store similar to these. I cut the fabric to size and Mod Podged it on and sealed it with Mod Podge also. I did not put fabric on the sides of the box or lid. Those are just painted black. Inside the box I put two dozen or so Heart shaped paper clips. 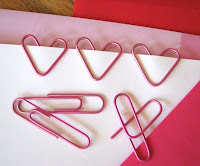 Now do not get all crazy and go spending a lot of money on heart shaped paper clips. I did go and buy red and white ones but that wasn't necessary either. How About Orange has a great tutorial on how to make the heart paperclip with only one bend. Find the Tutorial HERE. This craft had the biggest wow factor. 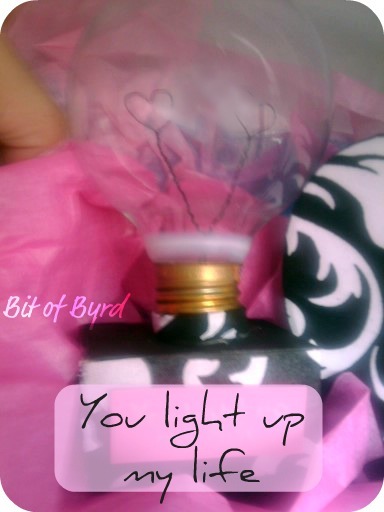 It also involved glass and a few tools so it isn't a kid friendly craft. I found the how to empty the bulb over at Team Droid. They give a great step by step HERE. There are several websites with instructions how to remove a light bulb filament, but Team Droid's instructions where the ones I used years ago and I find them the easiest to follow. The idea about making the heart shaped filaments came from the Design Sponge. Once I cleaned out the light bulb I used a small gauge jewelry wire to make my own heart "filaments" It is actually one long piece of wire folded in half and the ends make the heart. I did it that way so there would only be once piece of wire to secure to the base. To see the Design Sponge original post go HERE. The base is just a scrap piece of wood with the fabric wrapped around it. Painted black on the top and bottom. I also put a piece of fabric around the base of the light bulb to cover where it was a little mangled from being emptied. In addition to these items I also had balloons. Do you have a Dollar Tree near you? Did you know you can buy the balloons, take them home and bring them back with your receipt to have helium put in them? Reasons you would want to do this? All I did was buy a few heart shaped Mylar balloons and took a sharpie to them. I added hearts and "I Love You" it made the balloon more personal with very little effort and the possibilities are endless. 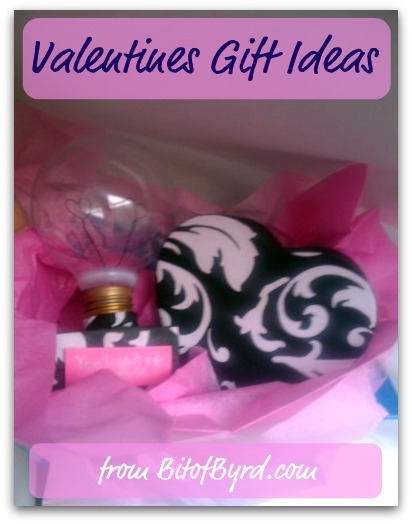 What kind of crafts have you made or gifts have you given for Valentines day? What has been your favorite gift to receive?